So, I’m attempting to type this on a tablet, which is really ANNOYING no judging me for any typos or formatting errors…! Here you have it, my vegan sticky toffee pudding cupcakes with a salted caramel sauce filling, vanilla buttercream and salted caramel chip sprinkles. Remembering back to my childhood days l couldn’t resist turning these little gems into ‘butterfly’ cakes and I’m glad I did because I think they turned out super cute. 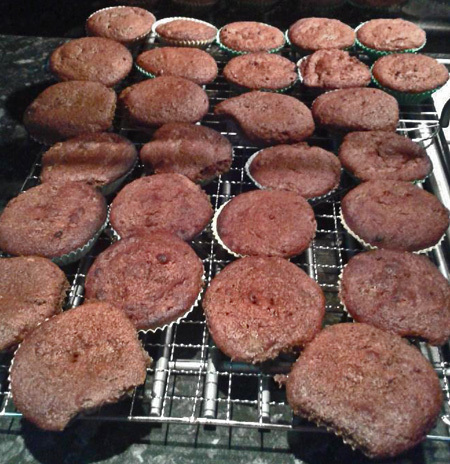 I made these to take into work but didn’t tell people that they were devoid of eggs and dairy. They went down very well and people were still talking about them the next day! I couldn’t find a recipe that I really liked the look of so I adapted several including a couple of non-vegan ones. I’m glad to say that I was very happy with the results. Rich, moist (hate that word!) and well and truly sticky! Pop the dates, hot water and vinegar into a food processor and blend until smooth. Set aside. Cream the marge and sugar using an electric hand mixer, until light and fluffy and pale. Mix in the treacle and golden syrup until smooth and fully combined. By hand, stir in the apple sauce. Sieve the flour, baking powder and bicarb and gently fold one tablespoon at a time into the margy-butter-syrup mix. Fold in the date mixture into the cake batter until thoroughly combined. The mixture should be beautifully thick and airy. Distribute evenly between your cake cases and pop into the oven. They should take around 10 to 15 mins but keep an eye on them. When done, an inserted skewer should come out clean. I basically, follow this lovely recipe but doubled up the mixture. 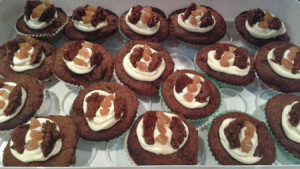 I changed the method slightly toon in order to make the sauce for the cupcakes as well as caramel chips for decoration. At this stage, pour half of the caramel into a bowl and stir in the vanilla and 1/4 cup of soya milk. Leave to one side – this is the sauce for the center of the cupcakes. Bring ingredients to a boil, keep stirring. Remove from heat and stir in vanilla. Pour into lined baking pan. Allow to cool and use scissors to snip off little chips, ready to decorate your cakes with. To stop them sticking together I kept them in the freezer until I was ready to use. Cream the marge in a food mixer. Scrape down the bowl, add the vanilla extract and continue to blend for one more minute. 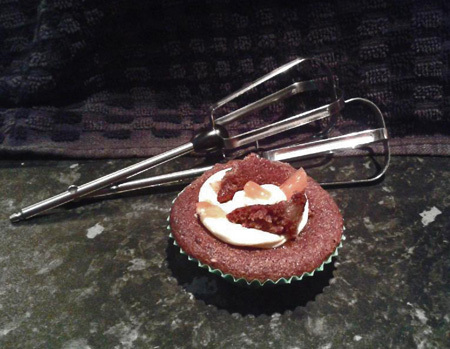 When the cupcakes are cooled – and not a moment sooner- use a teaspoon to carve a circular piece of cake out of the middle of the top of each. Keep the little circles safe as you’ll be cutting each in half to create the butterfly ‘wings’. Next, add the caramel to the hole in each cake. I would recommend adding just a teaspoon’s worth to begin with to make sure there is enough to go around, then top up with whats left. Finally, position your wings into the buttercream and decorate with the caramel chips.